The App Manifest file (WMAppManifest.xml) is a XML file that contains information about the app. These information includes the capabilities that app uses. The WMAppManifest.xml file can be found in the Properties folder of your Windows Phone project. 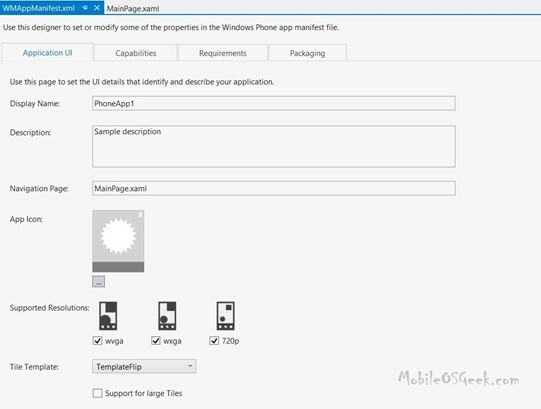 The WMAppManifest.xml file is generally used in the certification process and is also used to display the capabilities that the app uses when the user tries to install the app from the Windows Phone store. Another use of the App Manifest file is in the filtering of the app based on the requirements which is mentioned in the Manifest file. Below is a sample format of the WMAppManifest.xml which is created when you create a new Windows Phone project. There is also a GUI tool that comes as a part of the Visual Studio 2012 and Windows Phone SDK called “Manifest Designer” which can be used to edit the App Manifest file easily. To edit the Manifest file in the designer, just double click on the App Manifest file. Below is a screenshot of the Manifest Designer.